Are the kids looking to cool off? 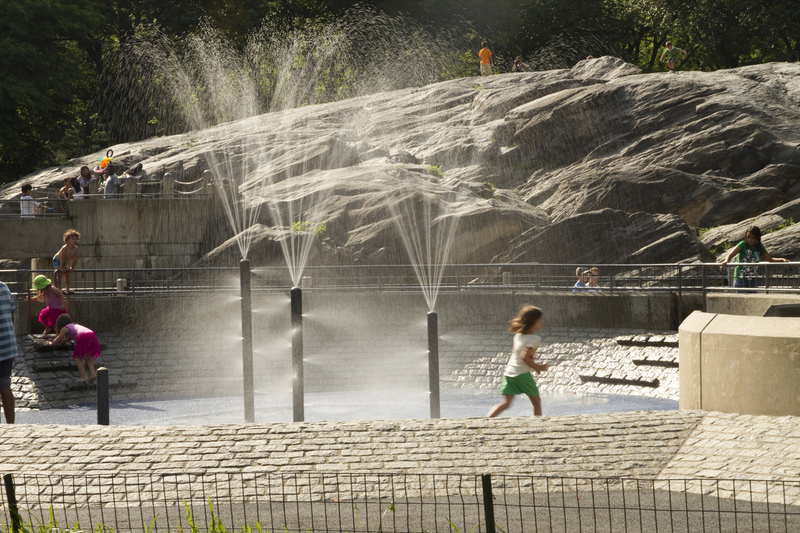 The best water playgrounds NYC has to offer provide plenty of summer fun. Sometimes the air conditioner just doesn't cut it. 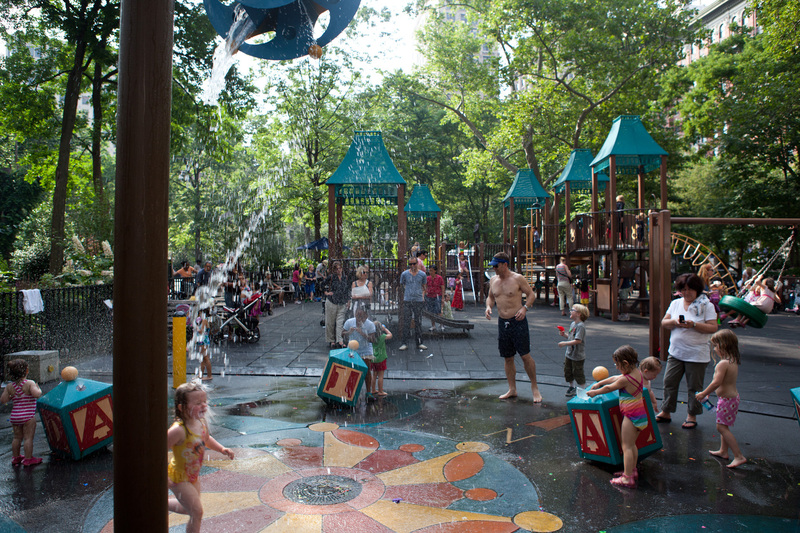 Lucikly, the best water playgrounds NYC kids love offer plenty of relief from the blistering heat. 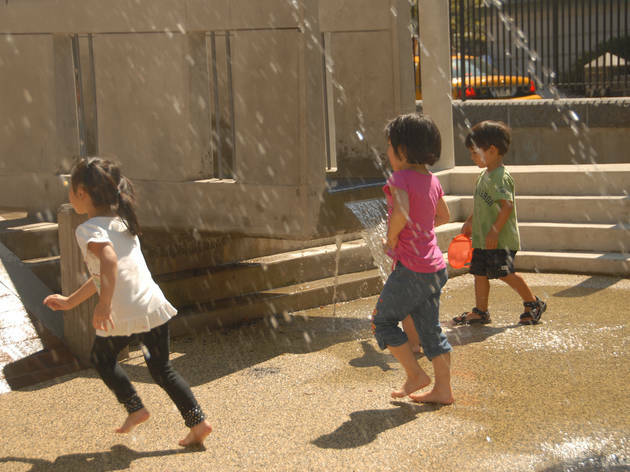 When temperatures get too high too quickly, little ones can't resist taking a dip in the wading pool or showering themselves under the sprinklers. Is there any room in there for adults? Even better? 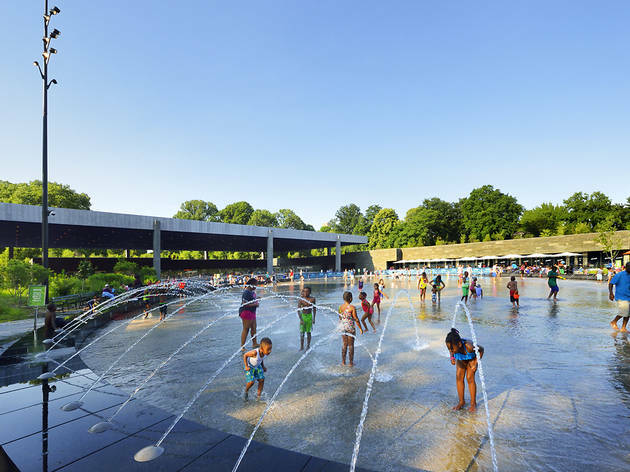 These venues are oftentimes nestled in popular attractions such as Prospect Park, so after youngsters enjoy the most adventurous sprinkler parks NYC offers, the whole family can embark on another adventure—picnics, playgrounds—and feel fully refreshed. Can't get enough outdoor fun? Swing by these kids' playgrounds, plan a day trip to discover the most delicious strawberry picking in New York or make the most out of your time off by booking one of these family weekend getaways. P.S...need your local spray shower turned on for the season? Read this. Domino Park, which will span six acres (a quarter-mile stretch) on the Williamsburg waterfront, is slated to debut in summer of 2018 as New York's hottest family-friendly destination. 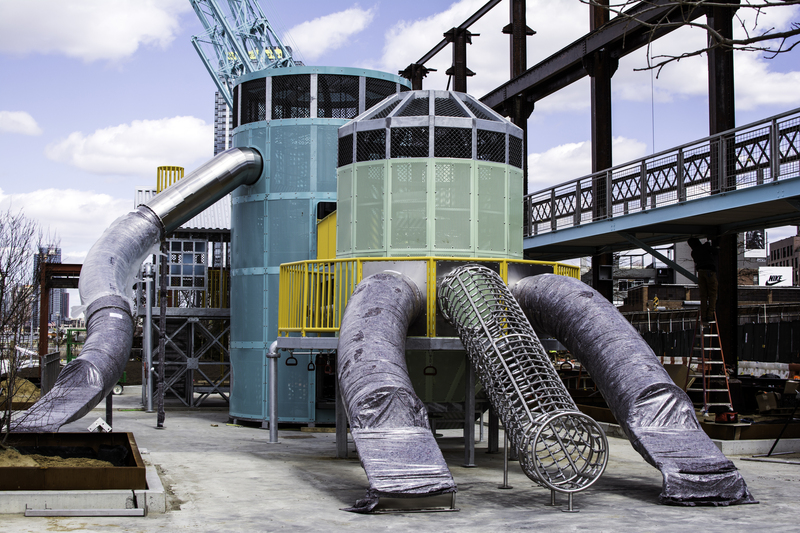 What's flown under the radar so far—and what we are definitely most excited about—is its brand new kid's playground and play space inspired by the sugar-refining process. 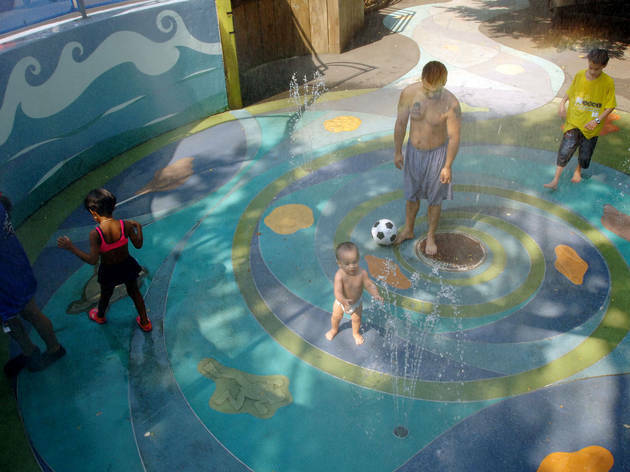 Plus, there will be a new splash park—right in time for summer! 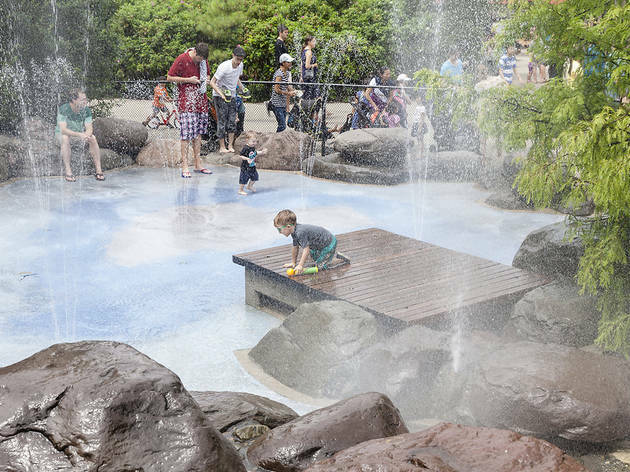 The water playground serves as a central water feature for the park, and it's separate from the playground and fairly minimalist with mist/spray streams scattered throughout. The water feature is encircled by seating (hooray! 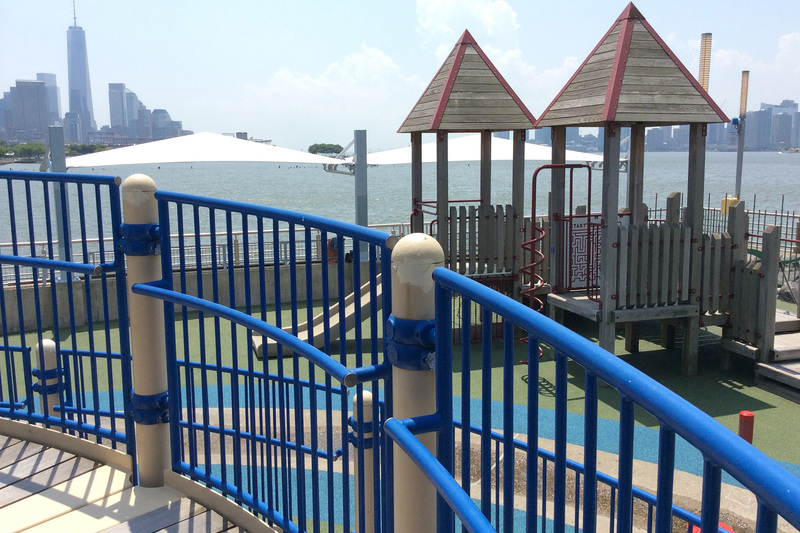 ), so NYC parents can get both a great view of the playground and the East River. 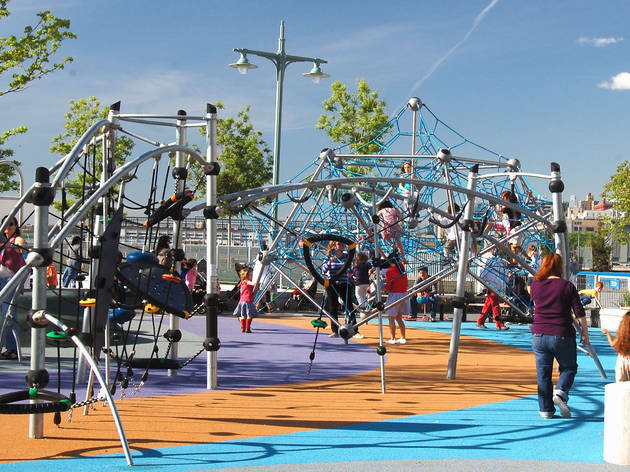 Yes, you’ll have to pay to gain access to this playground , but the incredible thought BKSK Architects put into this space make it well worth it. This outdoor playground has myriad niches that let kids discover the laws of the natural world for themselves—a.k.a. physics—in a way that enchants them. 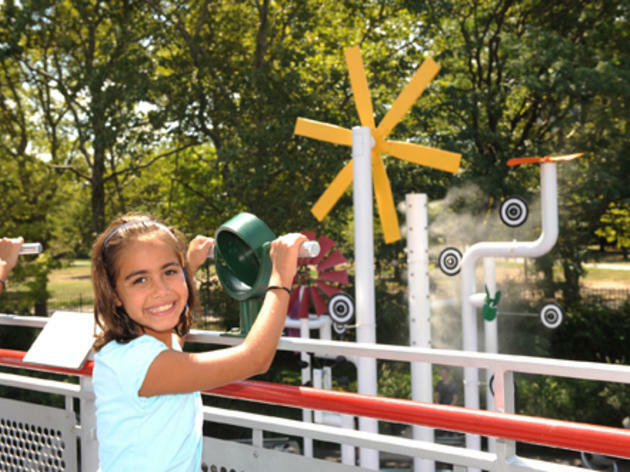 An elaborate Archimedes screw connected to a water table and two plastic slides with a drop that mimics that of a roller coaster are just some of the ways in which this spot sparks and satisfies kids' curiosity in equal measure. The dazzling makeover of Tribeca's pier, a stone's throw from Battery Park City to the south, is a dream for sporty types of all ages. 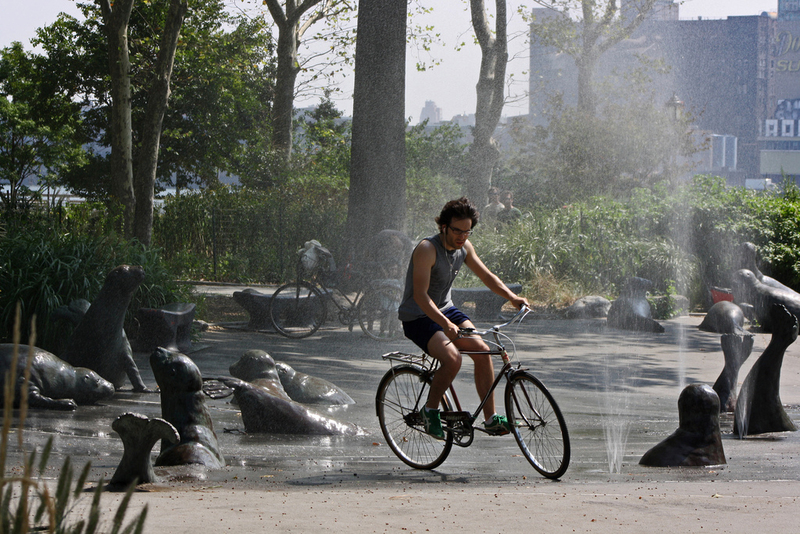 Fountains with a mind of their own—and others that are user-activated—make cooling off fun for all. 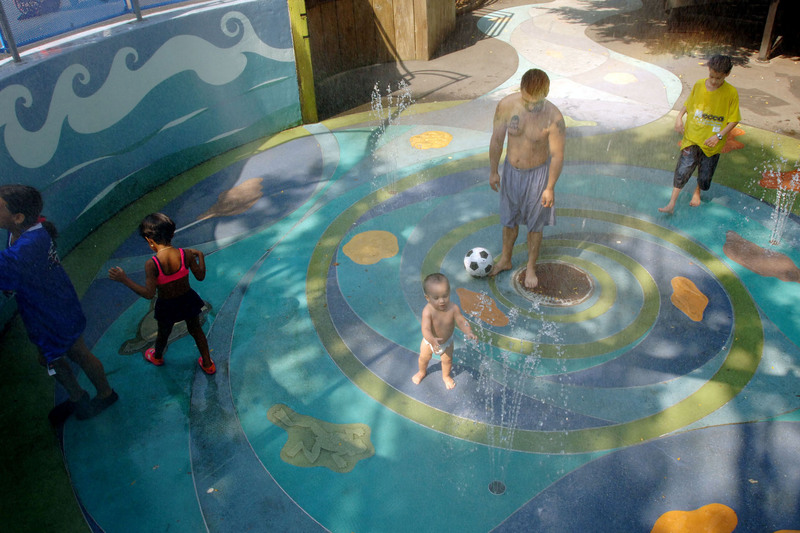 Youngsters can romp around in the sandbox, stand under an elevated water wheel and dry off on the swing sets. Just outside the playground you'll also find a skate park that's perfect for tweens, a mini golf course, and a field for kicking around a soccer ball or just having a picnic. 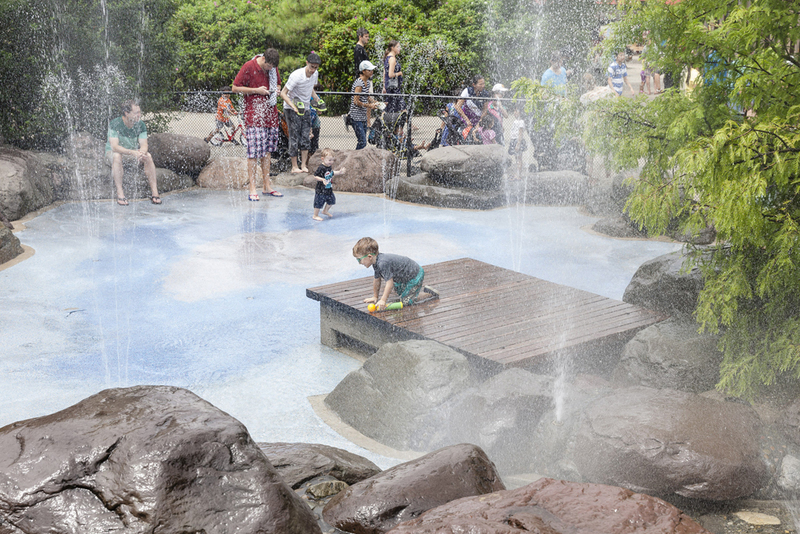 Nestled along the Hudson in an unassuming corner of the Meatpacking District sits this marine-themed playground, which provides interactive play for landlubbers and water babies alike. 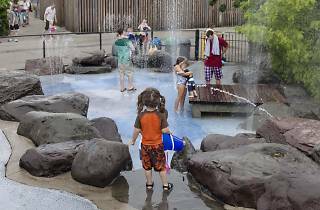 Challenging climbing equipment—including monkey bars, a jungle gym and a spiral ramp leading up to a lofty pirate’s lookout—gets them moving, while kid-activated water fixtures that spray cool streams from the ground and dump buckets from above keep them comfortable in the heat. Prospect Park’s all-in-one LeFrak Center effortlessly transitions from an icy wonderland in winter to a summer-fun hot spot. 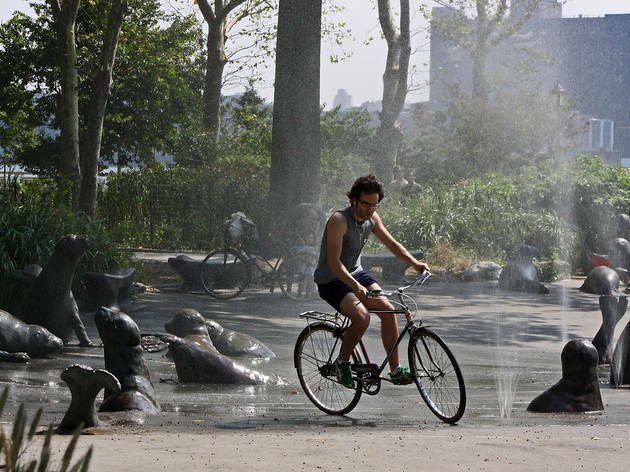 There’s a full day’s worth of entertainment, whether it’s biking along the park’s shaded paths or gliding on the 16,000-square-foot roller rink. 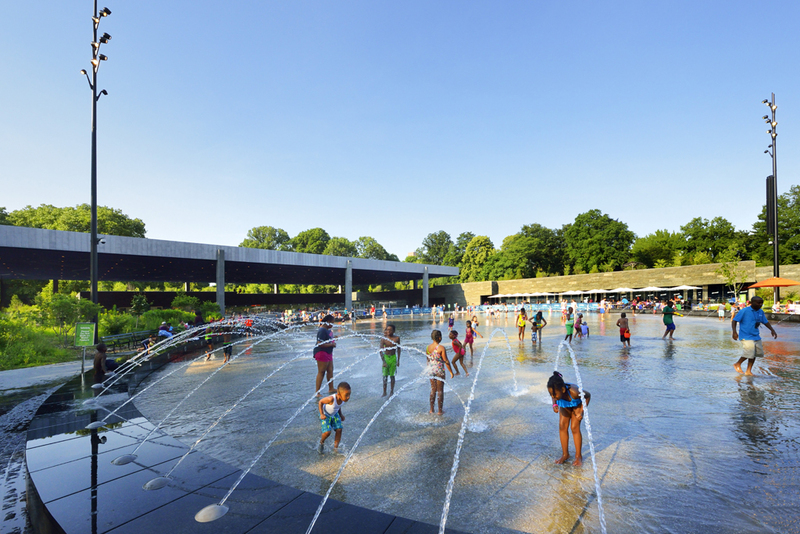 Pack a swimsuit because you won’t be able to duck out without dashing through the 41 sprinklers of the awesome Splash Pad (for those who are under 12). If you're really looking for water fun, check out the kayaking and paddle boarding options, too. Just in time to close out the dog days of summer 2018, the Chelsea venue, which was designed by Michael Van Valkenburgh, welcomes the community to explore newly constructed water features, a fun sand area plus a new shaded region where parents can catch a breather. 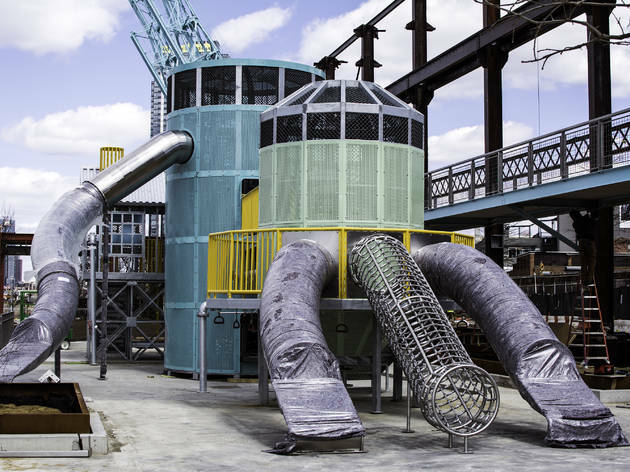 But perhaps what kiddos (and parents) are most looking forward to is the slide, a funky multi-colored structure channeling a familiar resident of the Hudson River Park Estuary: the pipefish. 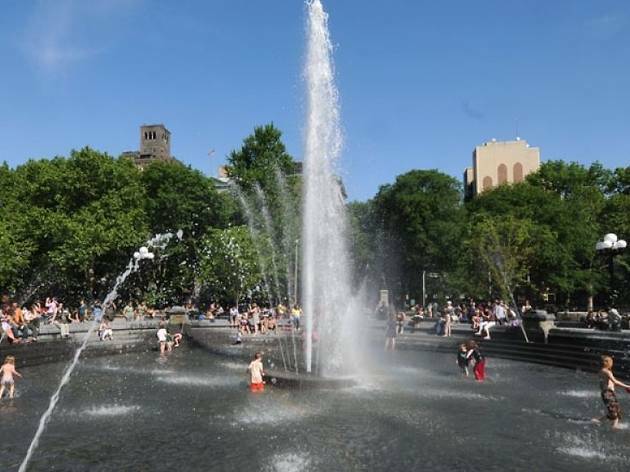 Head to Washington Square Park’s iconic fountain to chill out this season (you’ll probably run into some cool outdoor piano players and performers blowing bubbles). We’d say the fountain is best suited for all ages, since you can perch on the steps that encircle it, remaining mostly dry, or choose to accompany your kids in the water. Don't forget to bring water shoes and your towel, since parts of the surface can get slippery. 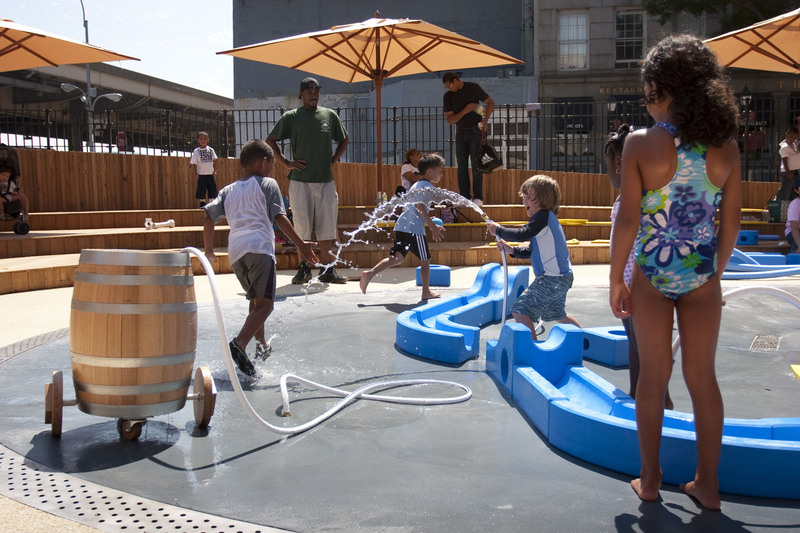 Eschewing standard design, architect David Rockwell hands kids the building blocks (literally) for their own fun at Imagination Playground: blue foam shapes that fit together every which way, spurting sprinklers and barrels to use on hot days. (Rockwell got the idea from his kids, who, when he brought them home an art table, gravitated toward the foam and box it came in over the gift itself.) The venue's whimsical seaside-themed elements, such as a semicircular boardwalk and mastlike poles in the sandbox, help it fit right in with its seaport surroundings. Hurricane Sandy might have taken a serious toll on the Rockaways, but the area has made its comeback (and taken steps to up its resiliency). 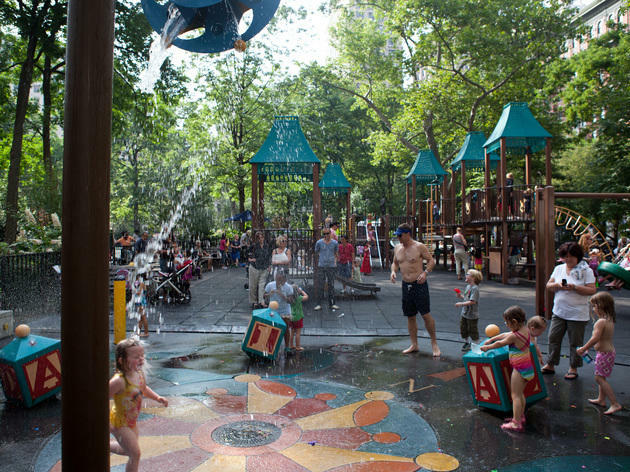 The NYC beach getaway offers plenty of sandy fun by the sea, but if your child prefers splashes in a safe playground environment, then the Beach 30th St Playground boasts climbable areas and sprinklers galore. 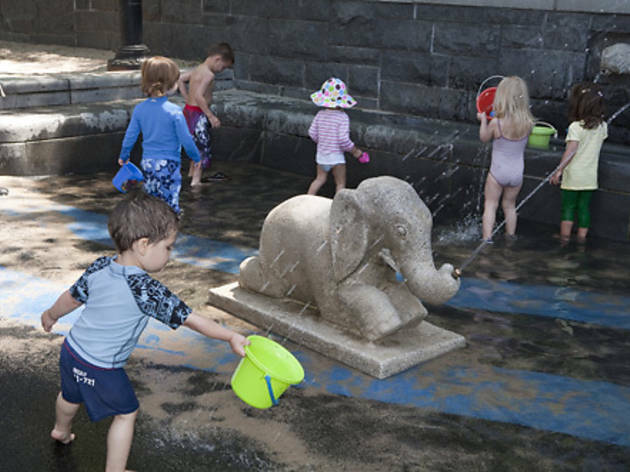 Little bathers can run under a series of blue arches that will soak them from head to toe and a ship playscape will have kids battling it out with water-shooting cannons to become king of the high seas! With killer views of downtown Manhattan, the Brooklyn Bridge and New York Harbor, Brooklyn Bridge Park is hard to beat. 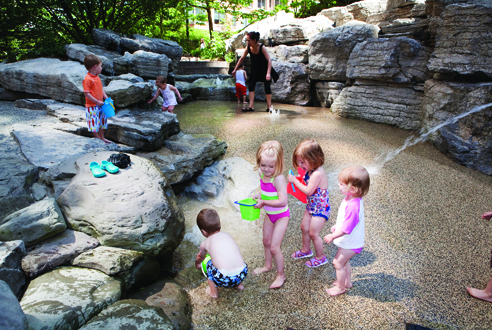 Its wonderland of water, sand and swings is epic, so prepare for kids to beeline to the stone-strewn Water Lab play area. (We'd highly recommend bringing water shoes—the rocks can get very slippery.) Once kiddos have had their fill of getting sprayed by a field of water jets and climbing the surrounding rocks, move on to the Tarzan ropes, swing sets or Sandbox Village to play and dry off. You’re going to be here for hours, so slather on the sunscreen and bring plenty of water! 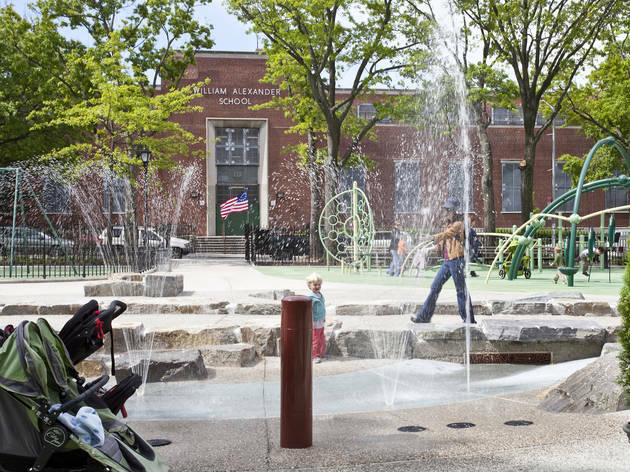 Inspired by the Egyptian Wing of The Metropolitan Museum of Art, this lavishly refurbished playground just north of the great institution is also the perfect post-museum destination. In a nod to the mighty Nile, a not-too-torrential blast of water pours down several steps onto a stretch of sand that represents the Delta. Other pharaonic flourishes include scalable pyramids and Cleopatra's Needle–style obelisks. Be sure to tote along sunglasses and sunscreen, as trees are in Sahara-like short supply. This massive compound has had a home in the southwestern corner of Central Park since 1927, providing a fun-filled pit stop for families on summer days. Tots can scale a climbing pyramid surrounded by bridges, moats and tunnels. Equip the kids with grippy, water-resistant footwear—as they work their way to the pyramid’s peak, they’ll slosh through a steady stream and won’t be able to resist stomping on the fountains that spray up from its base. 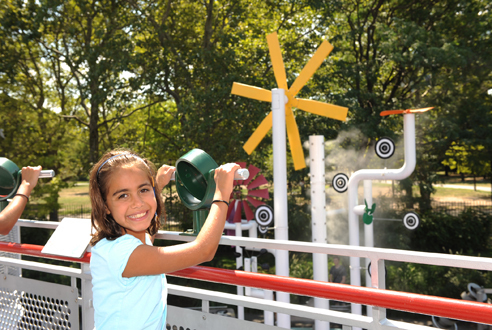 J.J. Byrne Playground comes complete with large water cannons, traditional sprinklers and an old-fashioned water mill. 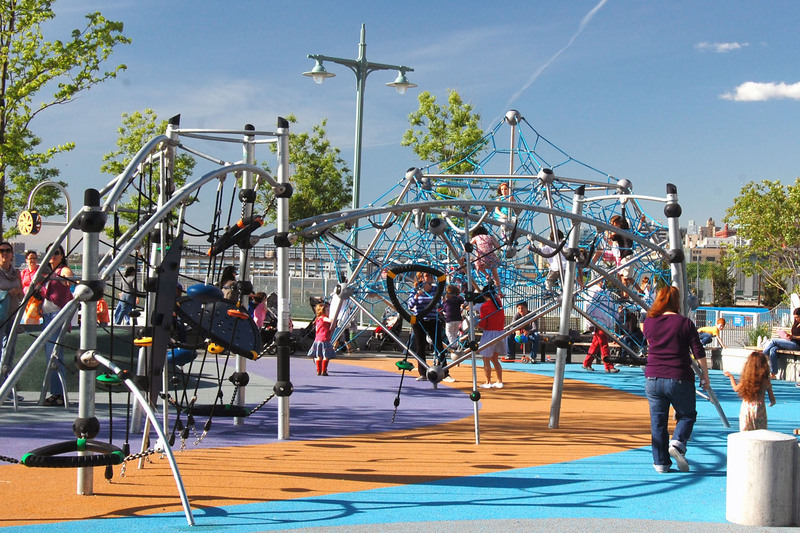 The playground also offers climbing structures, swings and plenty of seating for parents. Check out cool interactive panels by Brooklyn sculptor Julie Peppito that share a theme of the farming and Revolutionary history of the Old Stone House, the playground's esteemed Washington Park neighbor. 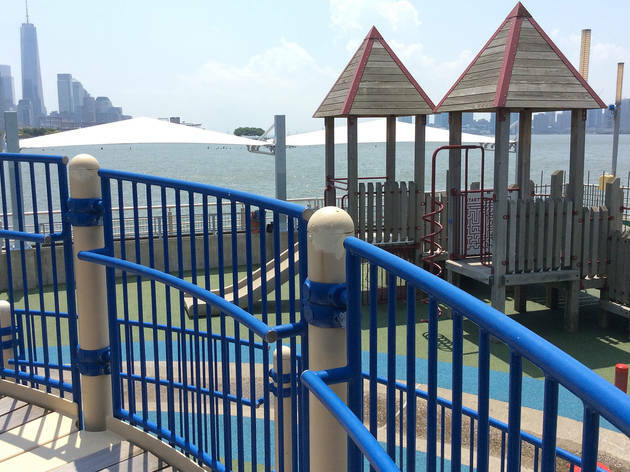 This park boasts amazing views of the East River, an amphitheater, playgrounds, gardens, sports fields and walking and bike paths along its 57 acres. 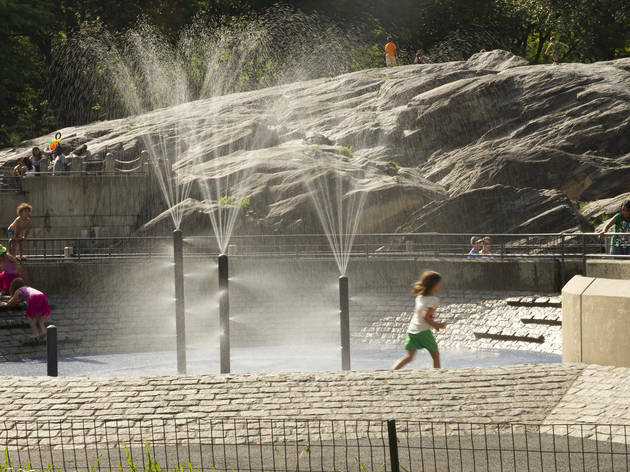 For a spot to cool off with the kids, head to Delancy St and FDR Drive near the Williamsburg Bridge to track down a cluster of spray showers. Little ones will love climbing and running between the cute bronze harbor seals as water shoots up from various ground fountains. Arrrgh, mateys! Send your mini pirate wannabes (and your landlubbers, too) to visit this spectacular oceanside fishing cove. 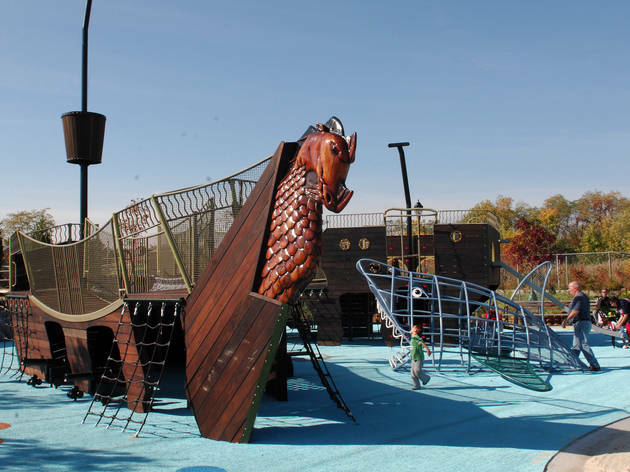 You’ll find rustic paths through the salt marshes, plus nautical-themed play areas including a convincing shipwreck and interesting shark and lighthouse-themed components. Your littlest kiddos will likely spend the majority of their time in the sand play area, but you’ll certainly want to check out the playground’s spray as well. This Queens play space, designed to accommodate children with and without disabilities, was the first of its kind in the country in 1984. A network of wheelchair-accessible ramps connects jungle gyms, slides, swings and even a 12-foot-long suspension bridge. Kids can explore a mini village, complete with a fire station, a schoolhouse, a house with flower boxes, a fire engine and a bus. After discovering every little nook, they can take to the basketball courts to shoot some hoops or play in the faux river encircling a sprinkler area while parents watch from amphitheater seating. Though built mostly from wood in 1992, this leafy enclave just north of North Cove in Battery Park City gains our vote for most unique play structures. 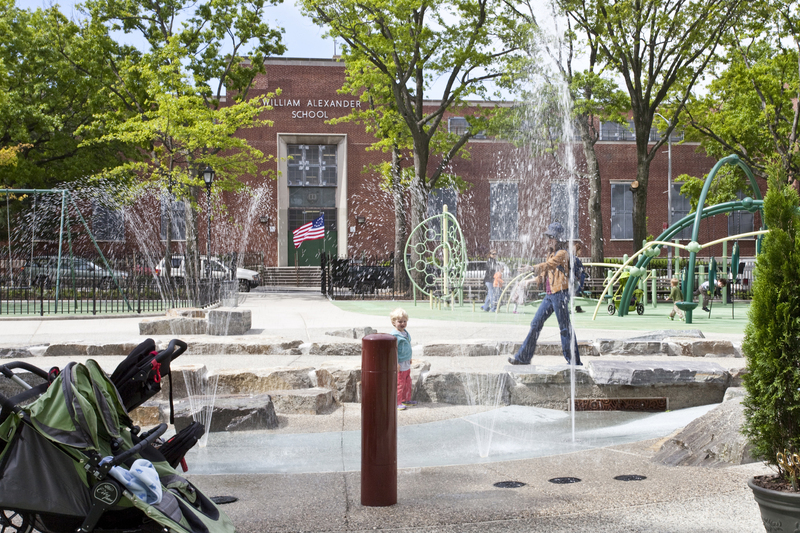 Located at the south end of Rockefeller Park, this maze-like playground offers sand and water play, plus all kinds of exciting equipment to engage your kiddos. 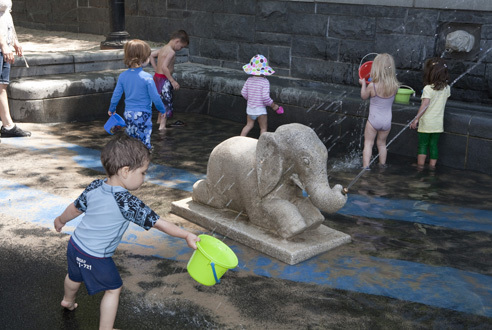 Spend the afternoon at the enclosed playground, chasing your tot from the manual merry-go-round to the water and sand table to the well-shaded dodo bird sculpture (created by artist Tom Otterness) which drips water. 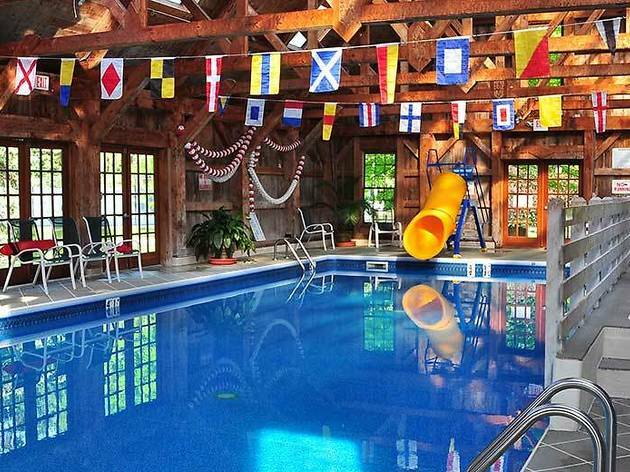 Older kids will want to hit up the sprinkler area, climbing net and the gazebo. On your way home make a final stop: a wall covered with stone dog and elephant gargoyles (outside the playground) that spit at passersby. Last but not least (and a final perk!) 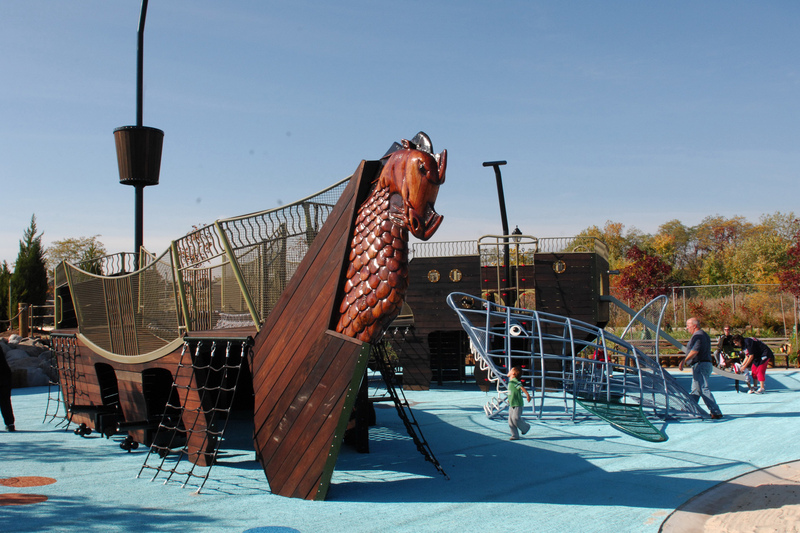 you’ll be close to must-see areas like the Rockefeller Park House (it lends toys and sports supplies including books, balls and games and is generally open from May through October) and the Rockefeller Park Basketball Court, which has adjustable hoops. Closed-toed shoes must be worn. What appeals to kids most about this amazing (and amazingly hidden) spot is its wild side and the sense of discovery it awakens. Canopied paths wind past huge boulders and grassy lawns, a ginormous metal slide seems part and parcel of a mini rocky mountain, and the tiered rocks surrounding the water-play spot make it feel more like a natural spring than part of a playground, let alone one in the city. 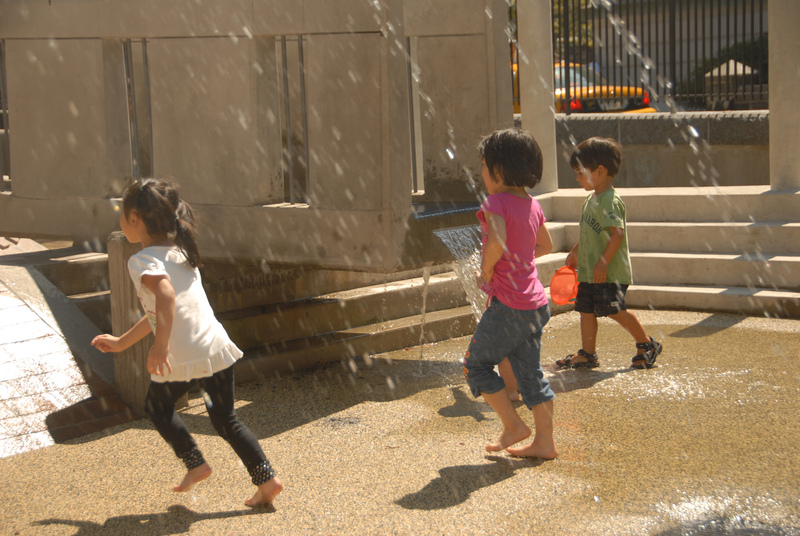 Kids in lower Manhattan now have a new and improved place for splashing around. 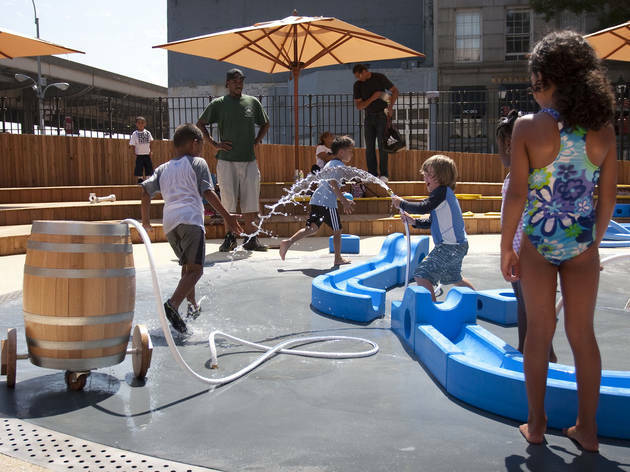 Pearl Street Playground, located near the South Street Seaport, reopened in 2012 after a two-year makeover. 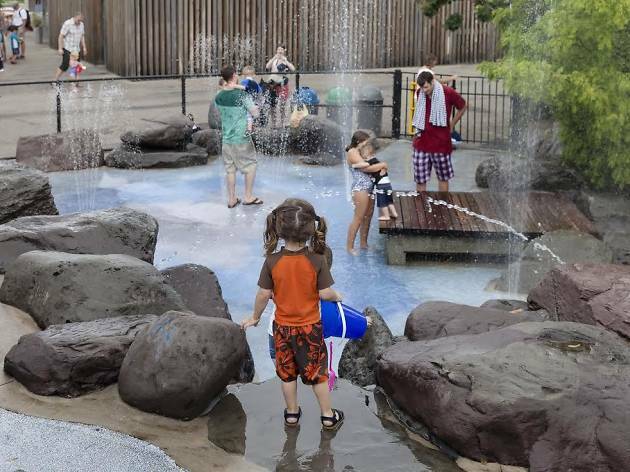 In addition to swings, slides and a shaded seating area where parents can rest their weary legs, the spot has an oyster-shaped sand-and-water play space—a nod to the former oyster shell heaps that once lined the waterfront.